Pronounced sense of style, bone-dry grooves, tons of soul and purring irony – these are the rather un-German qualities that have nevertheless turned De-Phazz into one of the main music exports coming out of Germany. The tendency of De-Phazz’ songs to creep into auditory canals, stimulate brain activity and electrify dancers to shake their legs are known all the way from Vladivostok to Anchorage, Ibiza to Kathmandu. German engineering has always been appreciated all over the world – it is innovative, technically sophisticated down to the tiniest detail and makes life more beautiful. This description also fully applies the band De-Phazz, founded in 1997 in Heidelberg. Created by the diligent sound collector and sample architect Pit Baumgartner, the “Godfathers of Lounge” have created the most reliable and pleasant German export commodity since Volkswagen Beetle and the most charming musical invention since the Fraunhofer Institute in Erlangen came up with the MP3. By the courtesy of smart bartenders, “Café del Mar”-style compilation and movie soundtracks, songs like “The Mambo Craze”, “Something Special” or “Cut the Jazz” (with more than 3 million plays on Spotify) went viral all the way back when the term “viral” was still associated merely with influenza. Baumgartner and his collaborators have sold over half a million records, black-market copies not included – possibly making De-Phazz the most burned band in Eastern Europe. The group has so far performed over 600 concerts all over the globe. This is probably one of their formulas for success and also a reason why De-Phazz remains operational even 20 years after the lounge revolution. It has never been one of those DJ projects where a producer keeps assembling an ever-changing and substitutable group of musicians for the studio. Thanks to the exceptional performances of Pat Appleton and Karl Frierson as well as outstanding soloists like trombonist Otto Engelhardt or Marcus Bartelt, De-Phazz remains brilliant not only in sound-insulated recording booths, but also on the big stage. For their shows, the band (for that is what De-Phazz truly is) always comes up with something innovative – whether it be a surreal video installation that pleasantly tickles the retina, smart technical gadgets or even tongue-in-cheek dancing go-go girls. The band is at ease both in concert halls and on festival stages, all the way from Canada to Russia. In addition to the unbeatable vocal duo of Appleton and Frierson, the drummer Oli Rubow has also been a regular for the last ten years. 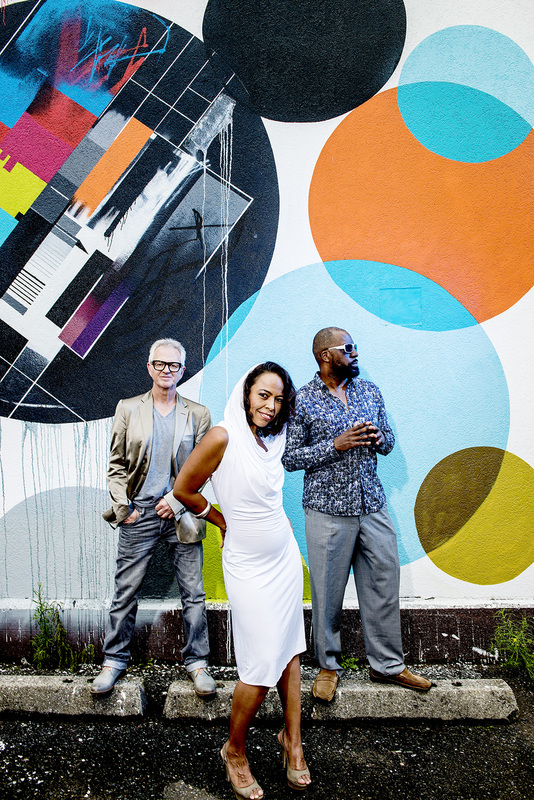 The group stands out even in the context of an intimate jazz club setting, as it could be witnessed in 2014 with their established acoustic format “De-Phazz Private”. The full name of the group is “DEstination PHuture jAZZ”. In 2018, the band celebrated its 21st anniversary with a new album and continues to give performances that are thrilling for the head, belly and soul. It is a blessing that De-Phazz still exists – for, in this day and age, more than ever, there is a genuine need for their poise, humour and good music.